Another in the continuing series of my book reviews for the Viral Blogger network. 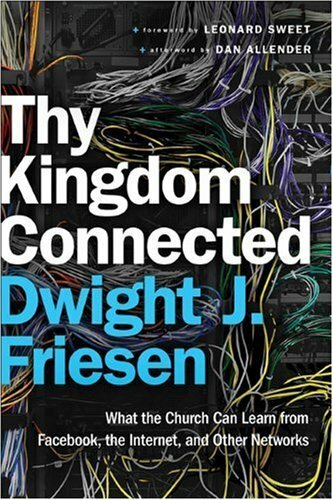 Thy Kingdom Connected is by Dwight J. Friesen. Let me get right to the point: I like this book. Friesen writes well; by this I mean the thought progression is easy to follow and I did not get bogged down in sentence structure. I also enjoyed this book for the same reason that I have enjoyed many of the better books I’ve read. It is truly a gift, I believe, for an author to be able to connect points the reader is likely already aware of in new and interesting ways. For instance, Friesen devotes several pages to Martin Buber’s work I and Thou. Anyone with a liberal arts education in the past 80 years, I assume, will be at least rudimentarily familiar with Buber. In fact, from my early undergraduate days, “I and Thou” is what comes to mind when I hear of Buber. Thinking of the Trinity in terms of relationship is nothing new; looking at relationships through Buber’s lens is old hat as well. Bringing these two together in the context of the social networking phenomenon is eye opening. Friesen opens eyes. Friesen makes connections – which is really what this book is about. Most of the books he cites (that I haven’t already read), I have added to my listed. The author’s understanding of the power of connections, which he brings out clearly in the context of his passion for ministry, drew me forward through Thy Kingdom Connected. Conversations subvert hierarchy. Let that sink in. Jesus eschewed hierarchy; his Church may well be headed (should be headed) back in that direction after centuries of structure, hierarchy, and bureaucracy. Conversations are such a simple tool, yet stand as the most powerful tool any of us might have to be a part of reclaiming the Kingdom vision within and around the life of the church. Thy Kingdom Connected is a worthy read for anyone interested in being part of what the church is going to look like 10 years from now.